Much of the info in this post is from an article on engadget. I became aware of the situation as I was working to build an IFTTT applet that would change my office lights to red if a website went down and I got an email about it from Uptime Robot. That applet can probably still be made but just not using Gmail anymore as a trigger. Google’s push to tighten third-party API access is already going to cost the world Google+, but a change that more of you might notice is coming to IFTTT. The service sent out emails alerting users that their “recipe” scripts involving Gmail triggers and an action that could create a draft will go away as of March 31st. According to Google, the shift is a result of the Project Strobe sweep it announced last October. IFTTT said it worked with Google to keep the integration that will support triggers to Send an email, or to Send Yourself an email, but the API lockdown that’s coming would’ve required too much work to change its services. Otherwise, integrations with Google will still be the same, but anyone relying heavily on the automated scripts may want to double check things before they get a surprise in a few days. In Search Console, the Performance report currently credits all page metrics to the exact URL that the user is referred to by Google Search. Although this provides very specific data, it makes property management more difficult; for example: if your site has mobile and desktop versions on different properties, you must open multiple properties to see all your Search data for the same piece of content. It unifies all search metrics for a single piece of content into a single URL: the canonical URL. This shows you the full picture about a specific piece of content in one property. For users with separate mobile or AMP pages, it unifies all (or most, since some mobile URLs may end up as canonical) of your data to a single property (the “canonical” property). It improves the usability of the AMP and Mobile-Friendly reports. These reports currently show issues in the canonical page property, but show the impression in the property that owns the actual URL referred to by Google Search. After this change, the impressions and issues will be shown in the same property. We plan to transition all performance data on April 10, 2019. In order to provide continuity to your data, we will pre-populate your unified data beginning from January 2018. We will also enable you to view both old and new versions for a few weeks during the transition to see the impact and understand the differences. API and Data Studio users: The Search Console API will change to canonical data on April 10, 2019. How will this affect my data? At an individual URL level, you will see traffic shift from any non-canonical (duplicate) URLs to the canonical URL. At the property level, you will see data from your alternate property (for example, your mobile site) shifted to your “canonical property”. Your alternate property traffic probably won’t drop to zero in Search Console because canonicalization is at the page, not the property level, and your mobile property might have some canonical pages. However, for most users, most property-level data will shift to one property. AMP property traffic will drop to zero in most cases (except for self-canonical pages). You will still be able to filter data by device, search appearance (such as AMP), country, and other dimensions without losing important information about your traffic. You can see some examples of these traffic changes below. Consider whether you need to change user access to your various properties; for example: do you need to add new users to your canonical property, or do existing users continue to need access to the non-canonical properties. Modify any custom traffic reports you might have created in order to adapt for this traffic shift. If you need to learn the canonical URL for a given URL, you can use the URL Inspection tool. If you want to save your traffic data calculated using the current system, you should download your data using either the Performance report’s Export Data button, or using the Search Console API. Here are a few examples showing how data might change on your site. In these examples, you can see how your traffic numbers would change between a canonical site (called example.com) and alternate site (called m.example.com). Important: In these examples, the desktop site contains all the canonical pages and the mobile contains all the alternate pages. In the real world, your desktop site might contain some alternate pages and your mobile site might contain some canonical pages. You can determine the canonical for a given URL using the URL Inspection tool. In the current version, some of your traffic is attributed to the canonical property and some to the alternate property. The new version should attribute all of your traffic to the canonical property. Shifts have grown at a staggering rate. In 2011, defenses deployed the shift — counting both the traditional (three infielders to one side of second base) and non-traditional varieties — during 3,065 major league plate appearances that ended with a ball being put into play,1 according to Baseball Info Solutions data housed at FanGraphs. That’s only 2.6 percent of all at-bats where balls were put in play. The number of plate appearance where hitters faced the shift has increased every year since, save for 2017. Last season, batters faced the shift in a record 40,730 total plate appearances ending on balls in play — that’s about 34 percent of such plate appearances. The era of the shift has coincided with a league-wide decline in batting average, though that is more a product of the record strikeouts rates in recent years as fewer and fewer balls are put in play, as batting averages on balls that are put into play has remained steady despite all the shifting, as you can see on the chart below. In 2011, batters hit ground balls 53.2 percent of the time when they put a ball in play against the shift. Last season that number was 43.9 percent, which is the lowest such rate since at least 2010, the first year for which data is available on FanGraphs. 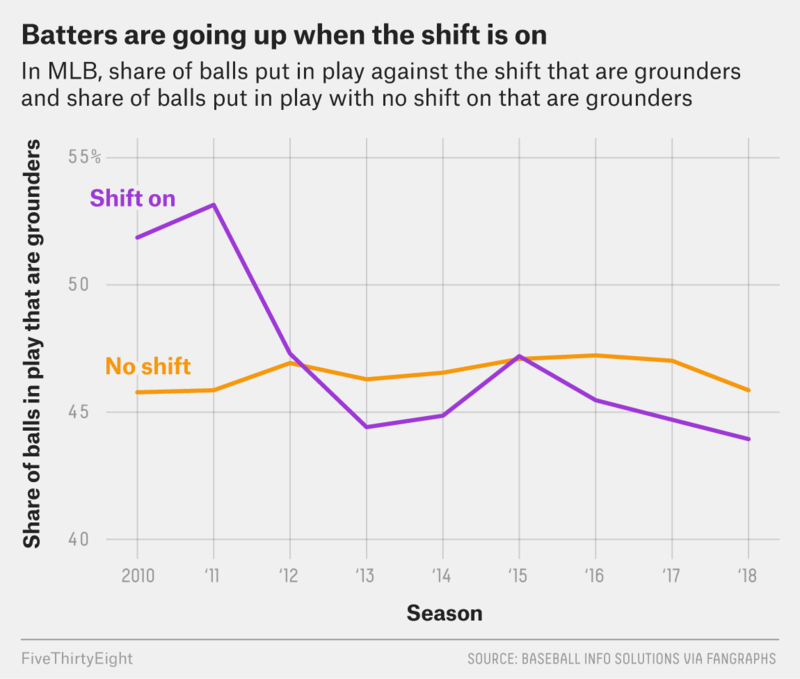 When batters are not facing shifts, ground-ball rates have remained steady. Batters had a 45.9 percent ground-ball rate in 2011 when not facing a shift and a 45.9 percent ground-ball mark last season. You can see the divergence in strategies in the following chart. The drop in ground-ball rates against the shift suggest that more players are trying to bypass the infielders altogether by knocking one over their heads. The average launch angle of a batted ball has increased in every year of Statcast era,2 rising gradually from 10.1 degrees in 2015 to 11.7 in 2018. But with the shift on, batters are even more likely to hit the ball in the air. The average launch angle against the shift last season was 14.7 degrees, a notable jump up from 13.1 in 2015. In addition to MLB-wide trends, I looked at the behavior of the regularly shifted-upon batters in 2018 to see how their approaches changed.3 This group combined for a 42.5 percent ground-ball rate when facing shifts and a 44.1 percent rate when not facing shifts. While more batters try to go over shifts, they are not always going to the air in the most optimized manner. Every hitter who has faced a shift has probably been advised to try and go the other way. 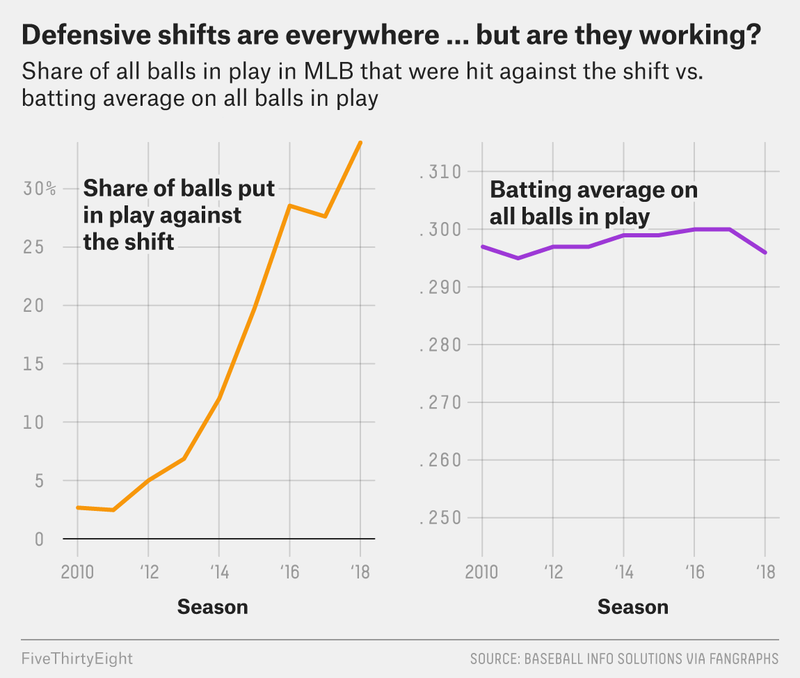 And as a result, the percentage of batters pulling line drives and fly balls against the shift has fallen off notably since 2010, from a 31.5 percent pull rate in 2010 to 26.2 percent in 2018. But by going the other way, batters might actually be hurting themselves. They are purposely avoiding the most valuable batted ball in baseball: a pulled ball in the air. Batters seem to unwilling to sacrifice potential power in pursuit of infield bunt singles. The percent of at-bats against the shift where the batter bunted has fallen four straight years, from 2.92 percent (2015) to 2.12 percent (2016), 1.88 percent (2017) and 1.73 percent (2018).